Just lovely! Ballet Slippers produces large 7 inch blooms of white with a blush of pink and a dark red eye. 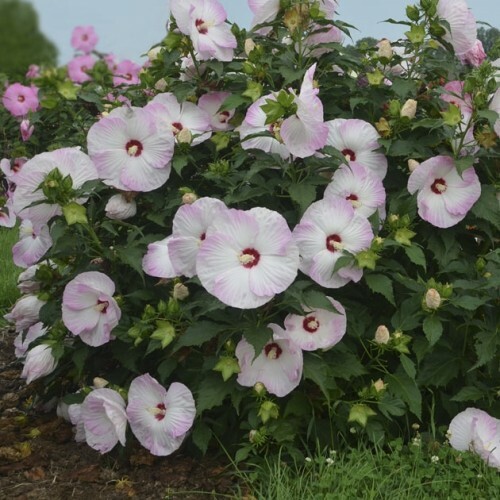 Hardy hybrid hibiscus is a vigorous, sturdy, erect but sometimes shrubby, woody-based perennial that typically grows to 4-8’ tall. These hybrids are winter hardy to zone 4 which distinguishes them from the many tropical to semi-tropical hibiscus on the market today. Each of their beautiful disc-shaped flowers can measure 6-10” across. Individual flowers remain in bloom for only one day, but one or more flowers usually open each day, in succession, over a long mid-summer to early fall sometimes to first frost bloom period. You do have to be patient because they come into leaf very late in the season – around June in some cases. But the very lateness of the hibiscus is its strong point – especially when it comes to the flowers. That being said, each plant can produce up to 250 flowers per growing season!